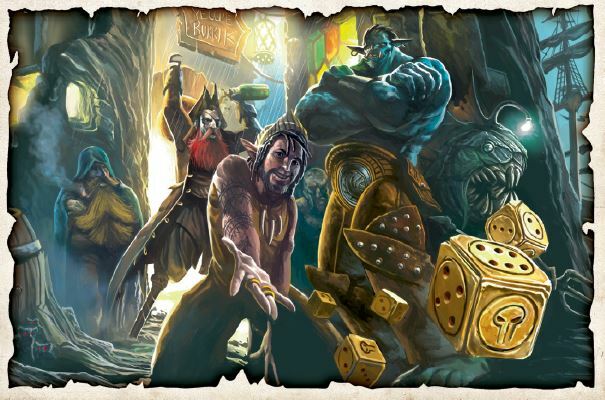 Freeport: The City of Adventure updated the Freeport setting to the full set of Pathfinder Roleplaying Game rules… as they existed at the time. Since we published the massive 544 page ultimate urban fantasy setting and sourcebook in early 2015, new hardbacks have been published for Pathfinder. Most notably Horror Adventures, Occult Adventures, Pathfinder Unchained, and Ultimate Intrigue. So does that mean there’s no room for the classes and ideas from those books in Freeport? Here’s a quick rundown of some of the most noteworthy ideas from those volumes, and how you can use them in your Freeport campaign. Of course you don’t need any of these new books to run an awesome Freeport game. But if you already have them, Freeport makes a fine place to use them! Okay, this one is really easy. Well, feel free to add everything, and to skip anything you don’t like the look of. The sanity rules in Horror Adventures can either replace or augment the madness rules in Freeport: The City of Adventure. Corruptions, especially deep one, ghoul, possessed, and shadowbound, tie neatly to the horror elements of Freeport, especially those touching on cults and elder gods. In fact, adding an advance corruption to an npc using the cultist npc class from Freeport: The City of Adventure is a great way to make a unique and unexpected cult leaders. The archetypes and class options from Horror Adventures are all perfectly appropriate for Freeport, but it’s worth mentioning the mad scientist (alchemist), dreadnaught (barbarian), elder mythos cultist (cleric), hexenhammer (inquisitor), cult hunter (investigator), bloody jake (slayer), serial killer (vigilante—see the discussion of Ultimate Intrigue, below, for thoughts on the vigilante), and elder mythos scholar (wizard) work particularly well for darker Freeport campaigns or for noteworthy villains. Similarly many of the feats, spells, rituals, gear, and magic items work best in the hands of npcs, though if players want to dip a toe into problematic powers, this book expands the ways a GM can let them to that. The advice on running horror games and the shot bestiary are solid, but it’s worth remembering that while Freeport has horror elements, it’s as much pulp swashbuckling adventure as it is fear or horror. Everything in Occult Adventures works fine in Freeport, but in general has a flavor of strange philosophies and traditions from far-off lands. A GM perfectly well can add an Academy of Psychic Sciences in the Eastern District of Freeport of a local, notable source of occult knowledge is desired, but these rules also present a wonderful opportunity to present fully flesh-out options for characters from “far away” to access to help them feel foreign and a bit alien. Given the nature of the Coils in Freeport cosmology such far-off lands could be anywhere, but existing options such as Mazin or Khaeder (or both) can also be reskinned as the home of psychic magic. This also creates a natural backstory for such characters, given that the ivory Ports on the continent are the primary traders with Khaeder, making them a logical starting point for Khaeder psychics, and a reasonable place to establish some small amount of psychic-aware schools and sages. The unchained versions of the barbarian, monk, rogue, and summoner work just as well in a Freeport game as the original classes (and, to be honest, the unchained summoner makes more sense and the unchained rogue is more flexible and interesting). The rest of the optional rules depend very much on whether you like the ideas behind them. There’s nothing about changing the action economy or altering skills that interferes with the rules from Freeport: The City of Adventure, and options like esoteric material components, innate bonuses, and scaling items can actually help reinforce the swashbuckling-with-magic feel of Freeport. Similarly the simplified monster creation rules work just fine, and if you like them, by all means use the,. There’s nothing about the Freeport setting that requires a GM to run games filled with intrigue, mysteries, social climbing, backstabbing, and interpersonal drama—but a lot of people sure seem to prefer it that way! For those folks, Ultimate Intrigue can be a significant boost to the level of talking, investigating, and scheming going on in a game. The rules on influence can easily be used to track the PCs interactions with factions throughout Freeport, ranging from the various crime organizations to businesses, nobles, the guards, and even specific captains and crews. The research rules are great for mysteries that need more than a single check to find the answers for. The heists section is more advice than rules, but can still be useful for a GM wanting to add more complex schemes to a campaign. The pursuit rules work fine for tacking people across the city, or across an island, but can also be easily adapted for sailing ships attempt to catch up to or evade on another, or beat each other to a destination. The social conflict rules offer more advice and a number of examples of how to add social challenges to a game, and if a GM could use some help getting the most out of the colorful personalities and politics of Freeport, these can be a good jump-starter. Then, there’s the vigilante class. There are many fantasy campaign setting where a character with a social identity and a separate, secret vigilante identity don’t work well. If a game is primarily focused on clearing out a dungeon, or fighting as part of a formal military unit, or learning magic at a wizard school, the vigilante class has very few opportunities to shine. That can be true in a Freeport game as well, but characters inspired by the Scarlet Pimpernel or some version of Robin Hood can work very well in a Freeport game that has a lot of social interactions and scheming. Before allowing vigilante PCs into a Freeport game, the GM should consider how they’ll interact with the campaign’s intended plot. Because the vigilante is built around the idea of having two identities, any player running one is going to look for opportunities to take advantage of that ability. If the campaign is going to include patrons and nemesis in social settings, and heists, and spying, and fights in back alleys the PCs would prefer not to get linked to, that’s likely to work well. If social interaction is going to be more straightforward, and most games focus on delving into cult temples hidden in the sewers or exploring new islands filled with ancient dangers, the vigilante (and characters using any similar options from the archetypes, feats, and so on in Ultimate Intrigue) is likely to get frustrated and have less fun. Of course there are lots of other sourcebooks available for Pathfinder, from a lot of publishers, ranging from 1-page collections of a few themed feats to 32-page player-focused books to huge tomes on psionics, dragons as player characters, and 1930s-era pulp adventures. More easily than many settings, Freeport can handle all of it, if the GM and players think a new set of rules or options looks good and interesting. Adding too much may make the setting lose much of its existing flavor, but that doesn’t mean it’d be any less fun. The fact the cosmology of Freeport includes the idea that the coils of Yig have already drawn in pieces of other worlds closer to Freeport, and with the right ship (and the right magic) a crew could sail to nearly anywhere, means that anything a group decided to add to a Freeport campaign “fits in,” even if it’s something so strange the locals are likely to shoot first, and ask question alter.